I made the questionable decision to travel in Norway in the middle of the winter. Who goes to a place even darker and colder than home when a beach vacation would be much more rejuvenating? I had my apprehensions but I'm glad I went with my gut. Clad in Canada Goose, I ventured into the frozen natural beauty of Western Norway and to my surprise, I practically had the place to myself! These photos were taken on a boat tour of Naerøfjord that was private because of lack of other tourists. There was something so serene about being out in the middle of that icy water with hardly anyone else. Silence. Only the sound of the gentle breeze and lapping waves. Surrounded by such beauty and crisp, clean air, it ended up being more restoring than getting blasted and passing out on the beach for a week. 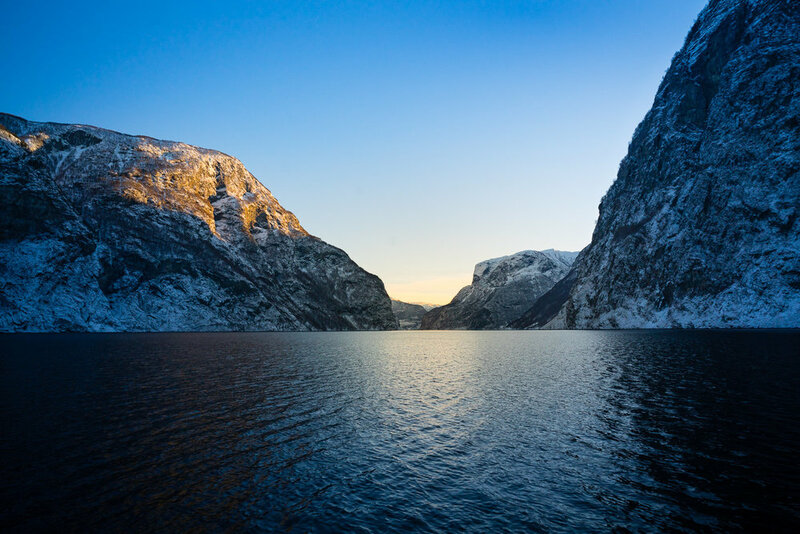 My boat guide said these fjords never look the same twice—they're constantly changing under light and shadow and with the weather. And though he spends every day out on them, he never gets tired of looking at them. Seems like a great life to me! Any image on this site can be made into a high quality fine art print for purchase. Please contact me.